INSTRUCTIONS: Remove the drum brake assembly including the backing plate so all that remains is the spindle. Inspect the spindles for grooves and cracks caused by excessive wear from the old bearings. Worn spindles must be replaced before continuing with the installation.Next you will need to bolt the caliper mounting bracket to the engine side of the spindle. Attach the steering arm pointing toward the rear of the vehicle placing the provided short spacer between the spindle’s front lower mounting hole and the steering arm. It is recommended that Loc-Tite adhesive sealant be used on the top 3/8” Allen head mounting bolt. No sealant is necessary for the two lower bolts. Attach the aluminum hub to the rotor with the supplied 3/16” Allen bolts using Loc-Tite, torque these bolts to 7-9 ft. lbs. Install the inner bearing and seals and place the rotor on the spindle. Install the outer bearing, washer and spindle nut. Slide the caliper onto the bracket with the bleeder up. The caliper may not slide into place due to a bump in the casting next to the piston bore. In some cases, it will be necessary to grind this bump flush using a bench grinder. It may also be necessary to grind away a small portion of the caliper where the brake hose mounts to allow the new banjo-fitted brake hose to be installed so it does not interfere with the spindle. In some cases, it may also be necessary to grind the spindle near the anchor bolt boss for proper bracket fit. Reinstall the caliper and turn the spindle full lock left and right to check for any interference. Loc-Tite is also recommended for the caliper mounting screws. 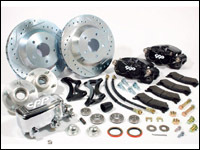 For more information on the Super Street Kit and other “bolt-on” disc brake kits, contact Classic Performance Products for your free catalog or visit our website at www.classicperform.com.